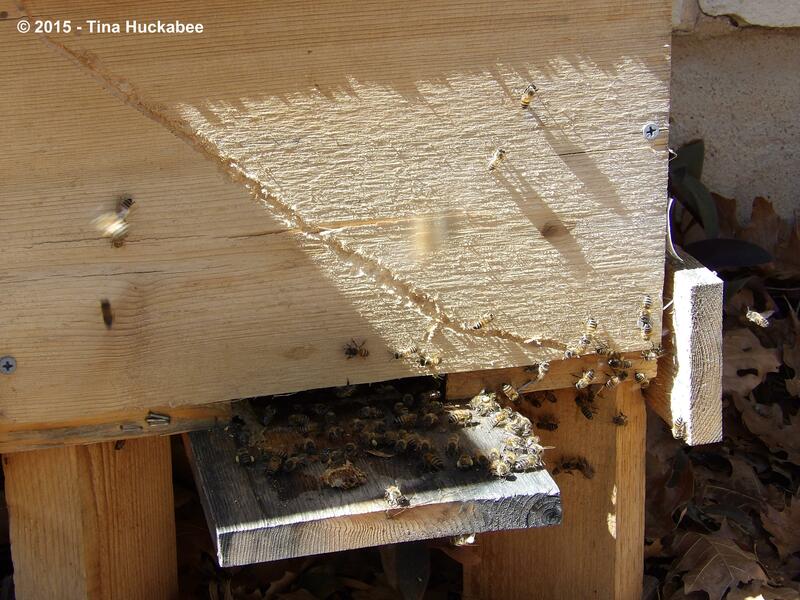 Since the beginning of its existence as a honeybee hive, Scar has had, well, a scar across its front. The notable gash is a result of a table saw accident during construction. The table saw operator was none other than Bee Daddy and he suffered injuries and a resulting scar, as well as some nerve damage on another finger. Because Bee Daddy enjoys, um, let’s just say a quirky sense of humor, after he healed and we finally completed the hive construction, he opted to use the damaged piece in the final product. The hive’s name, Scar, hails from that ignominious beginning. As the hive was two years old before we hived our honeybees a year ago, the wood is now three years old and has been out in the elements for a bit of that time; it’s showing some wear. 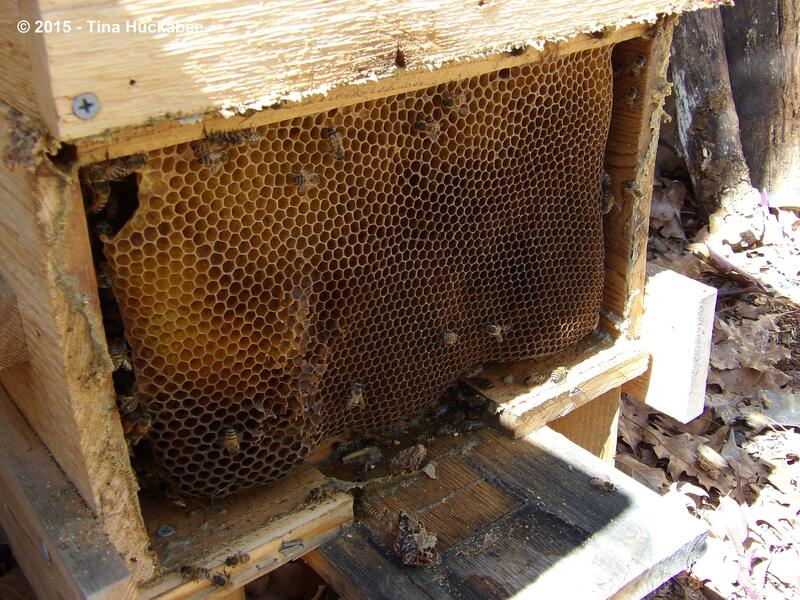 The hive is made of cedar, which weathers beautifully, but the wood piece in question, a practice piece of sorts, is pine and damage and warped. It began to pull away from the box above it, potentially exposing the inside of Scar’s hive. 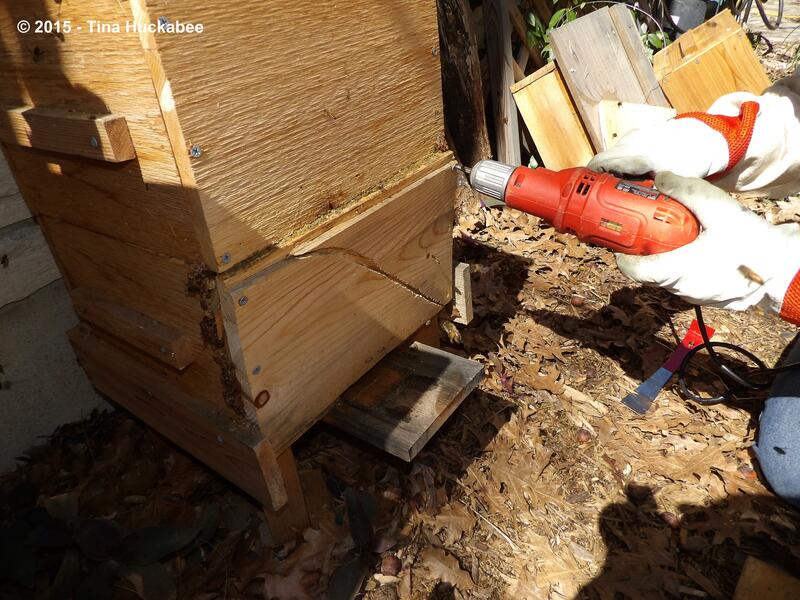 If not for the dutiful and exact work of the bees to seal any openings with propolis and my stuffing the on again/off again emerging crack with comb that we’ve harvested, our little Scar bees wouldn’t have been as cozy and safe in their hive during the last part of winter. 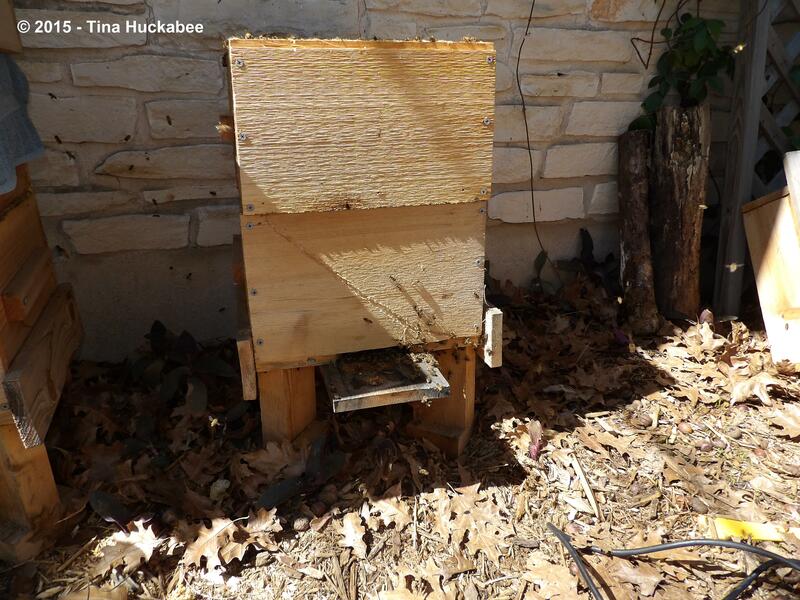 The time came that the comb-patch just wasn’t working anymore–Bee Daddy really needed to construct another piece to replace the disfigured and deformed front with a new, fresh piece of cedar–a honeybee hive facelift, if you will. 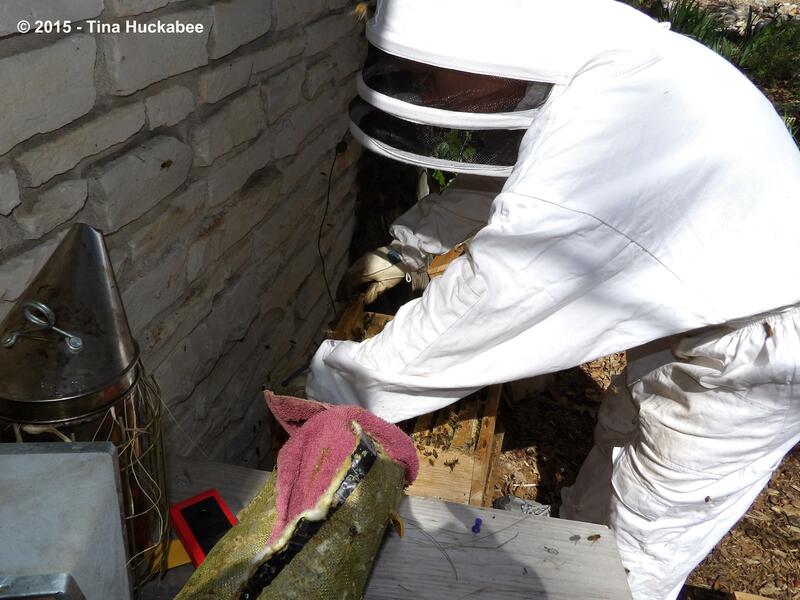 About two weeks ago, as part of our monthly hive check, we operated on Scar to replace the contorted front panel. Suited up, smoker fired, bee surgical equipment at hand, we’re ready to go! 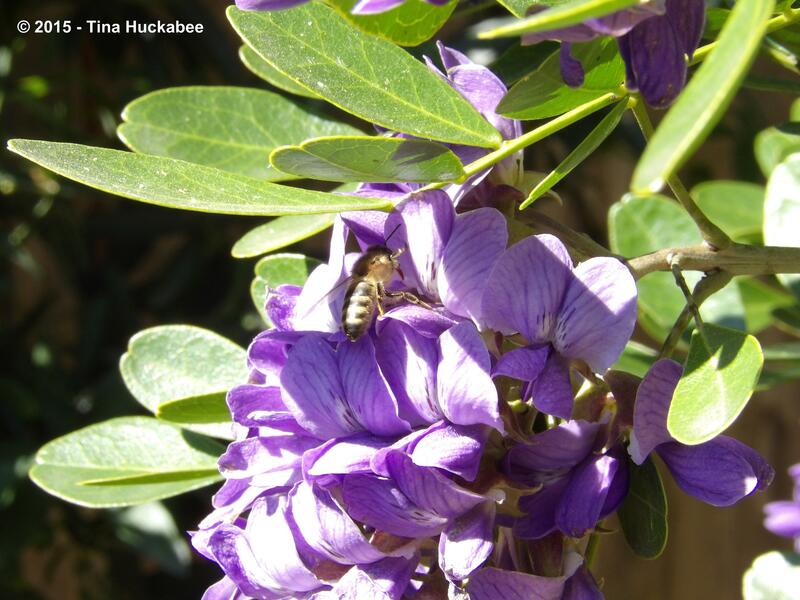 Look at those bees and their early spring work. Unfortunately, sometimes as I pull the top-bars up and out for inspection, the comb breaks. 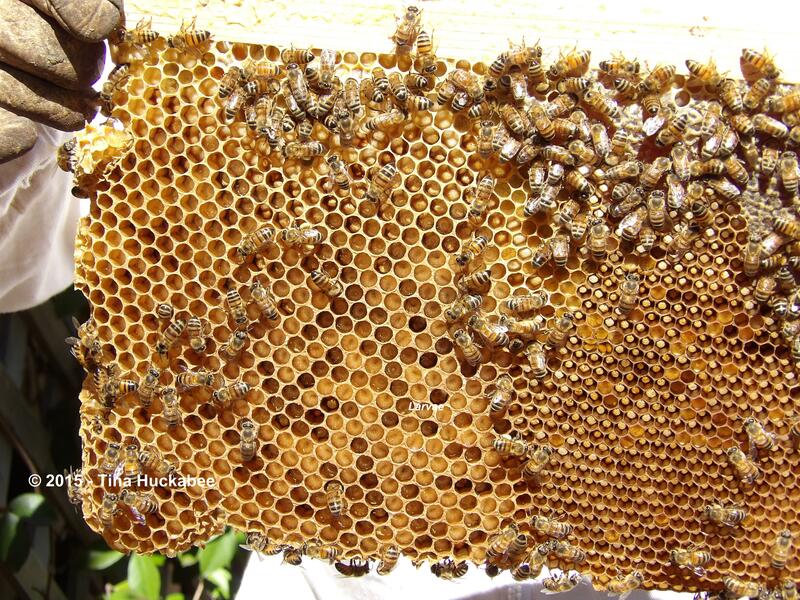 Here you can see some newly exposed larvae (little white blobs) within a broken comb. These larvae were large and probably capped, which is the last stage of development. I don’t know if the nurse bees saved those particular larvae. I always feel badly when I set the bees’ work back, but the Warre hives and top bars make the human part of the beekeeping equation tricky at times. 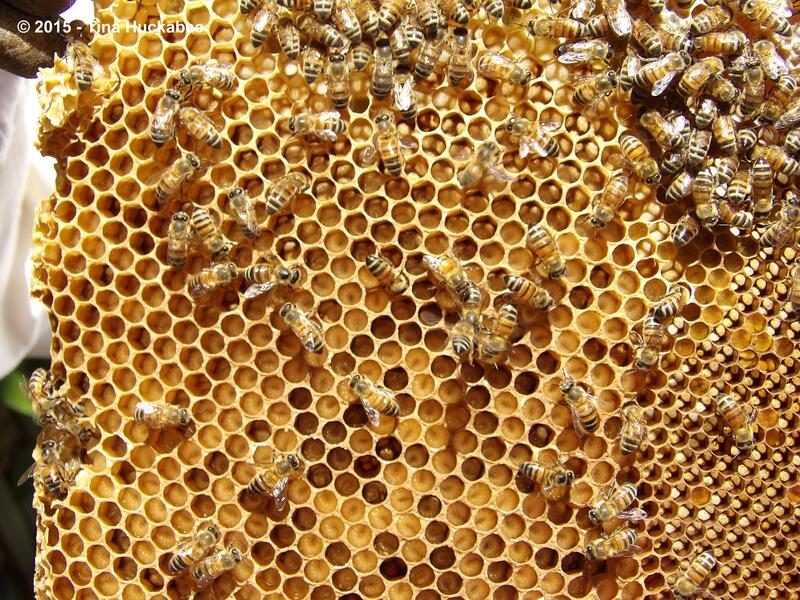 If the bees can’t re-cap the larvae, the hive consumes the protein and re-uses that material. 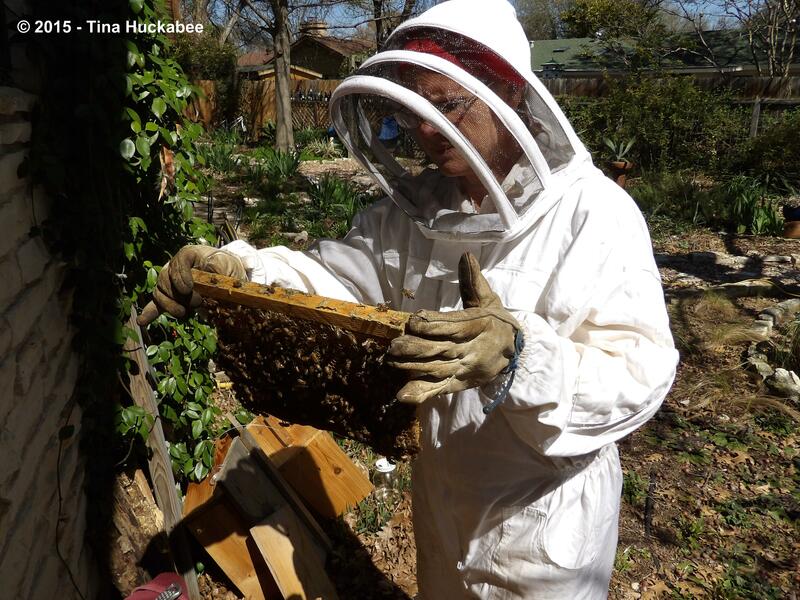 It sounds gross to us, but really it’s a remarkable use of their resources–they waste nothing and it’s all for the good of the hive. As Spock would say: The needs of the many outweigh the needs of the few. Bee Daddy readied the drill and the deconstruction began. I thought the noise of the drill would annoy the girls, but they were well smoked and laid back. The front came off with no problems. As I imagined this project and the steps required to quickly and efficiently remove one wall and replace with another, somehow in my head, I thought comb would be attached to the front wall. Scar’s facelift is a success! 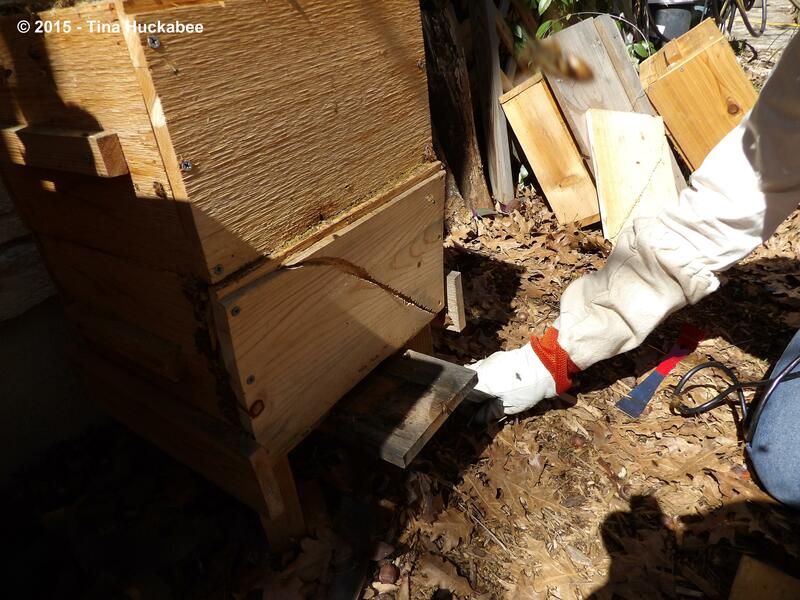 The operation only took a couple of minutes and we popped the top box and roof on and left Scar to calm itself and get back to the business of being honeybees. I believe I mentioned the odd sense of humor my beekeeping partner has? 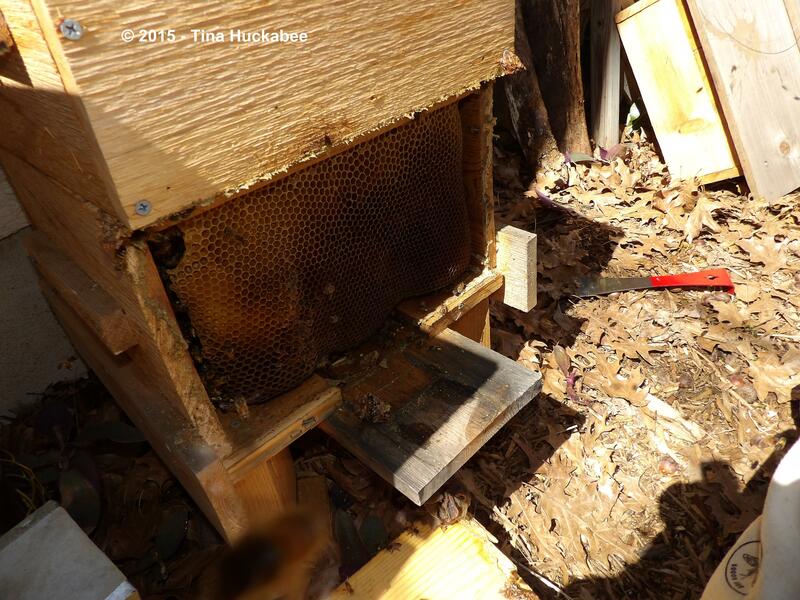 He decided that before attaching the new piece of wood to the hive, to recreate a scar in the wood. After all, we don’t want to change the name, do we? …and all looked good there as well. 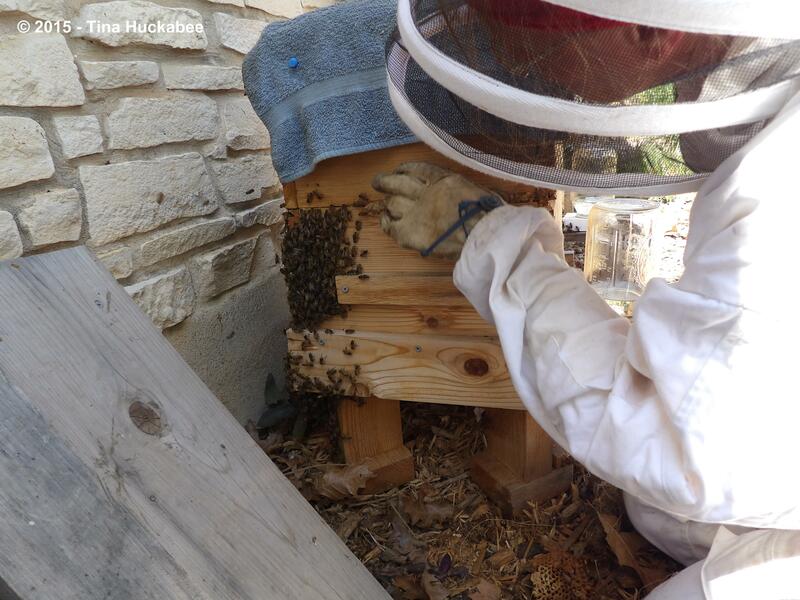 Capped honey, capped and uncapped brood– spring is buzzing right along for both hives. I feel a great sense of relief when we check our bees and all is as it should be. 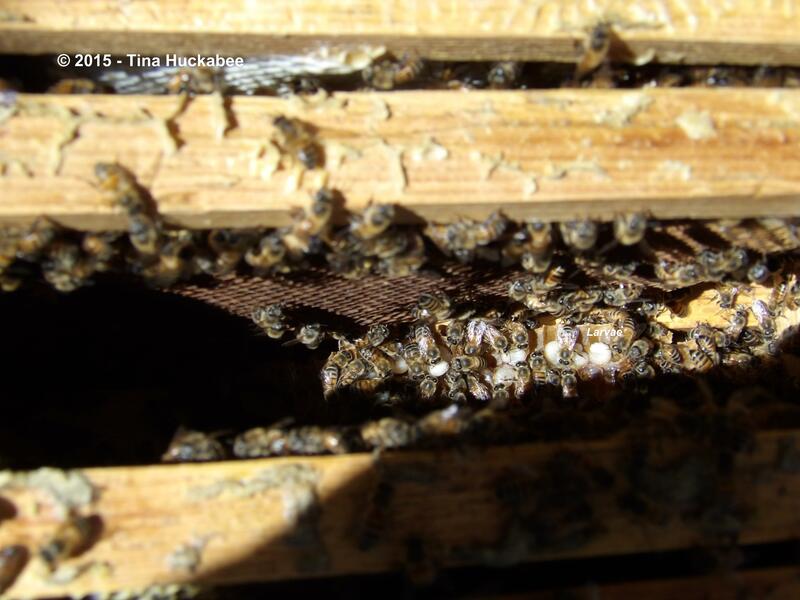 Mufasa’s bees clustered along the back and sides of the hive for a while, but within an hour or so, all returned to the hive, except for the foragers and the guard bees placed in front of the hive. 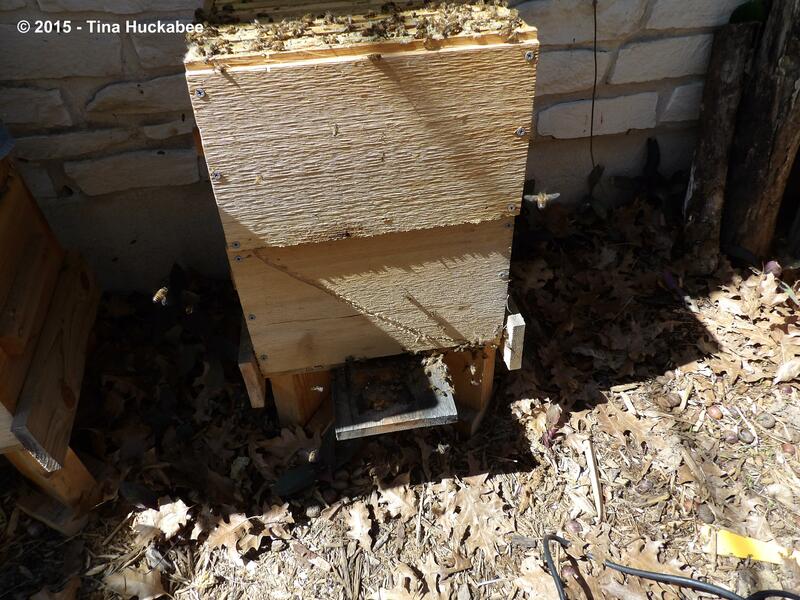 The honeybees are off to a good start for their second spring. I suspect that the next time we check Scar, we’ll add another box, as there was so much full comb in the first. 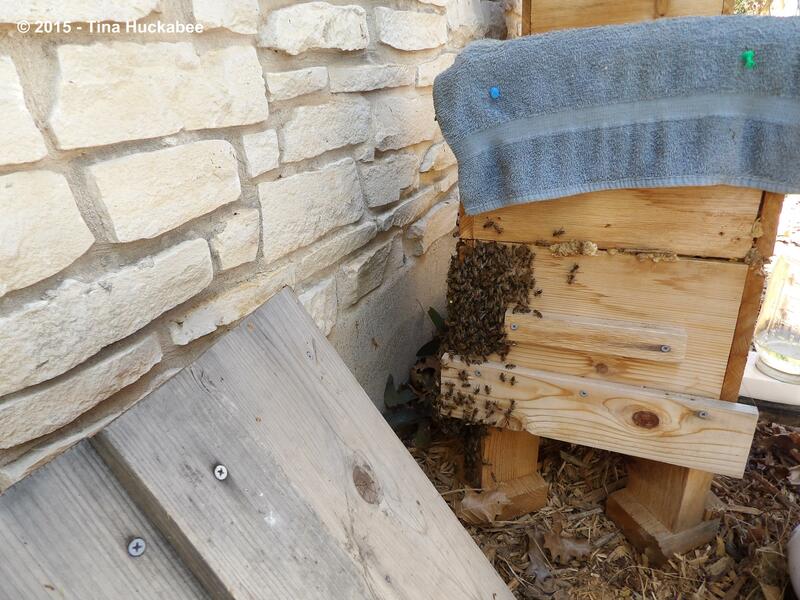 And while Mufasa remains the smaller hive, the bees are producing brood, comb and honey. 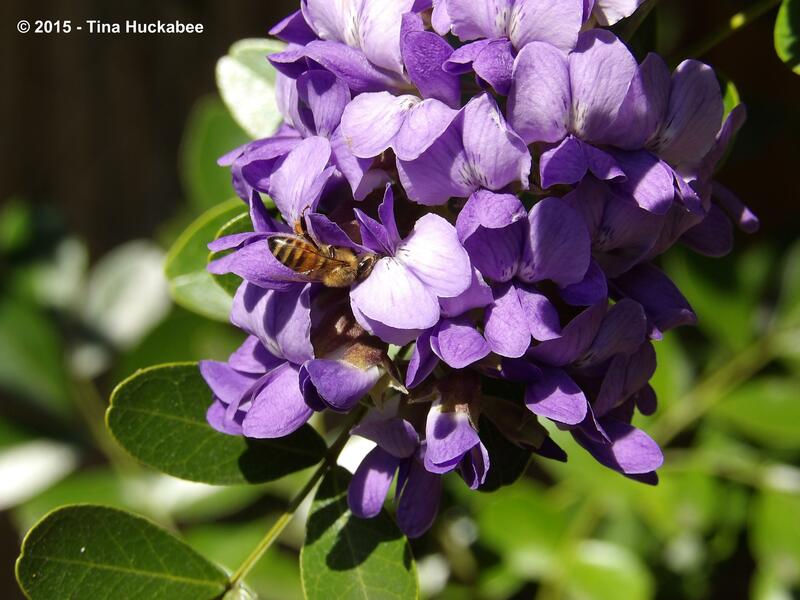 …the bounty should continue for our honeybees. Last night, I could smell honey in the air. 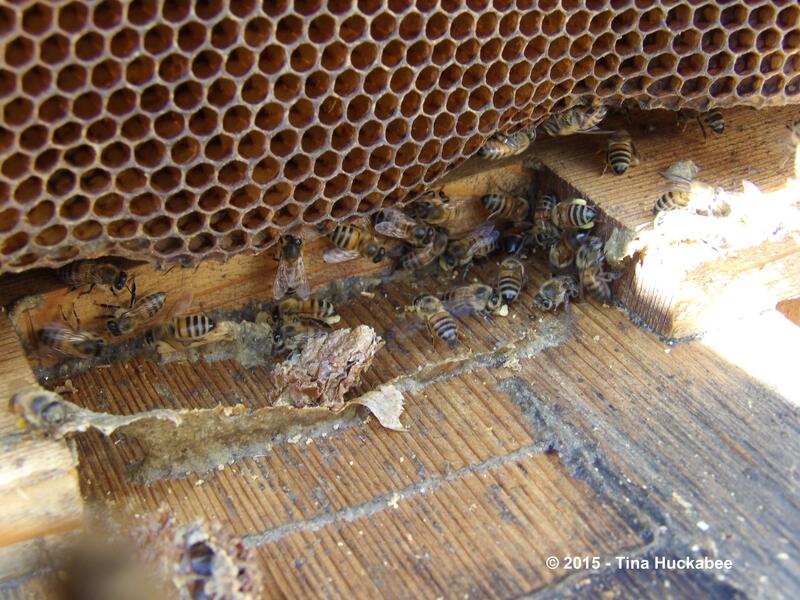 This entry was posted in Beekeeping and tagged Honeybee Hive by Tina. Bookmark the permalink. I love a story with a happy ending! And as to the smell of honey in the air, well I’d contradict you if I could really breathe through my nose at the moment. (actually, things aren’t that bad… yet… but we allergy whiners have so much competition in the area hyperbole becomes the norm!). As usual, I fretted and fretted, worried that the procedure would be unduly messy and destructive and it was easy-peasy. So sorry you’re stuffed up!! It’ll get better, soon I hope. Honey connoisseur? Hmmm. I did notice that the fall honey (the latest batch) is richer in flavor and darker in color. Not better, just different from the spring, which was lighter. I can’t really taste anything in particular, but then, all I know that they harvest is from my gardens and they’re foraging throughout the area. When I shared some of the spring honey with a friend, she thought it tasted like peaches. She lives near to me and assumed that the bees had foraged at her peach tree. I don’t think that’s correct though, because we hived the bees last spring after the flowers had bloomed on the peach trees in our area. I do know that there are serious beekeepers who attempt to control what they grow so as to control the flavor(s) of the honey. And, when I took a class at Round Rock honey, they gave us samples from varying times of the year and it was amazing to me the different the honey tasted. A fun story with a good ending. 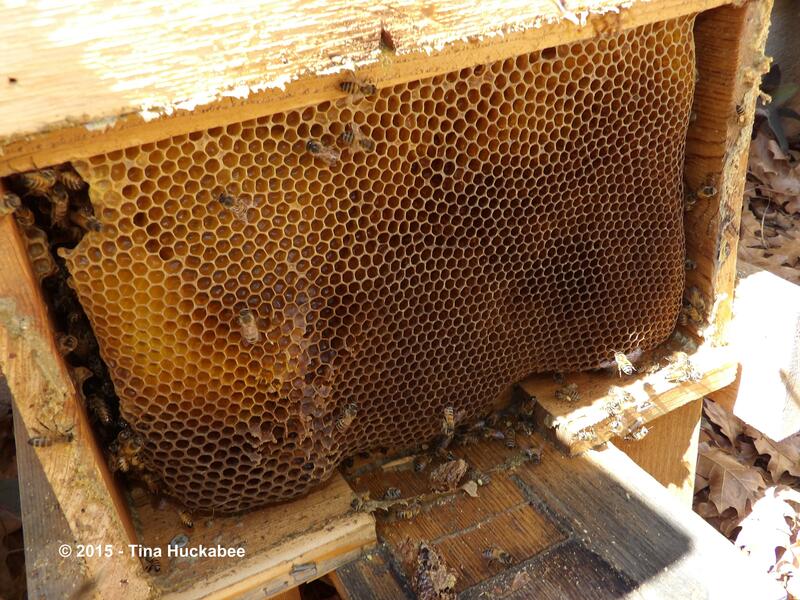 It’s so interesting to see into the hive and how you manage the bees. 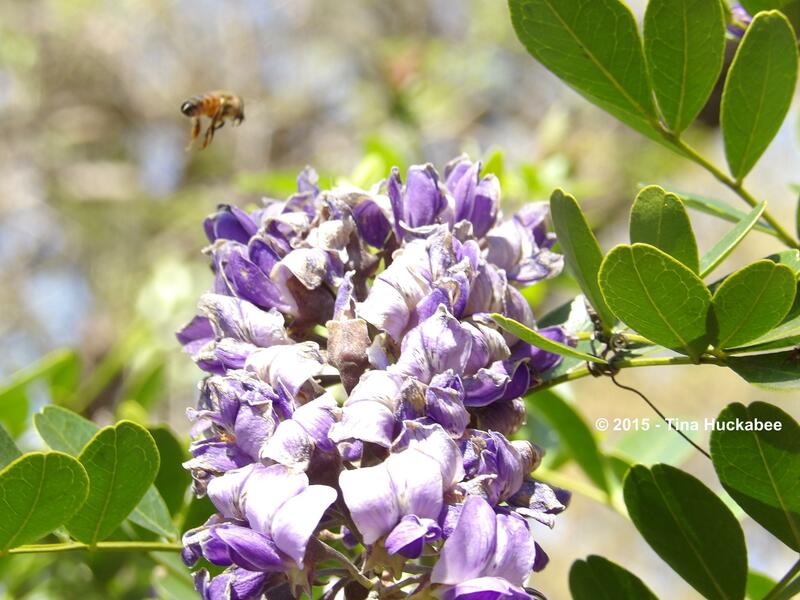 When we lived in California the beekeepers would bring hives into the orange groves during bloom time and orange blossom honey was quite popular. I’ll bet that orange blossom honey was fabulous!! What happy bees! And that sense of humor speaks to mine. I’m glad for the new scar. I love your “geek” humor. The new “scar” is genuis. 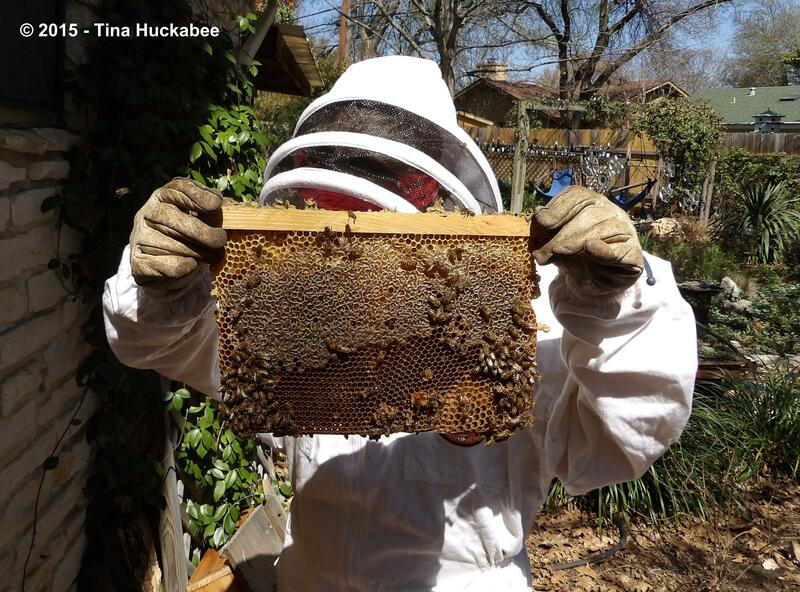 How encouraging to see the hives’ healthy and producing after the long winter. You had me scared with the title of your post, though! 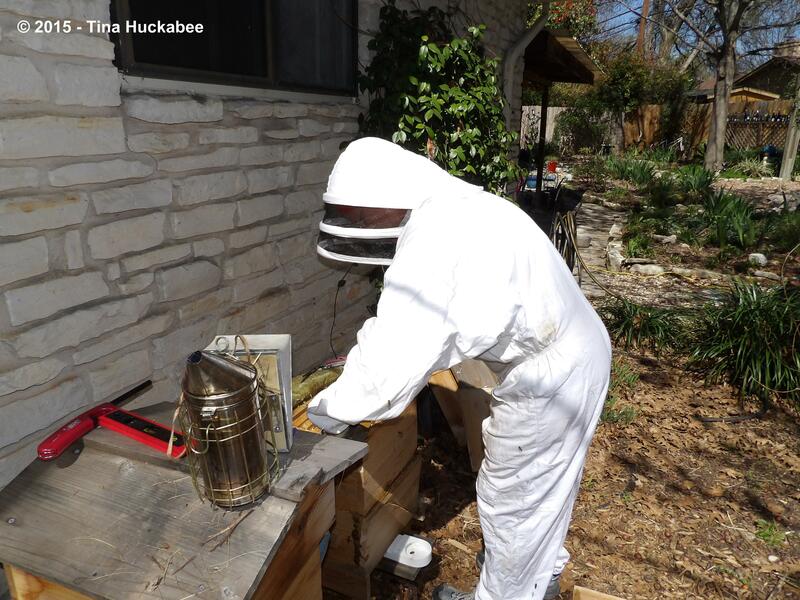 Both hives seem to be just fine this spring. I need to go in this weekend or next, because Scar may need another box placed–which is a good thing, I think, considering that our spring blooms are coming on in full force. Sorry for the fright!! I hope it was a fun read, instead. A sense of humor is mandatory–in all things, including gardening and beekeeping. “Bee Daddy”. That’s too cute. I haven’t ventured into bee keeping yet, but it’s still on my to do list. I wonder what broccoli flower honey tastes like because the bees in my hood are pretty busy with that right now. I’ve also seen honeybees at broccoli flowers and other veggie/fruit flowers (they pollinate 80-90% of our food sources) so I’m not surprised that you have those little guests. This is so cool! And I didn’t realize that you could put honeybees so close to your house. I don’t really eat honey, but I like the idea of keeping bees. Unfortunately, I don’t think I have anywhere good in my yard to put them. 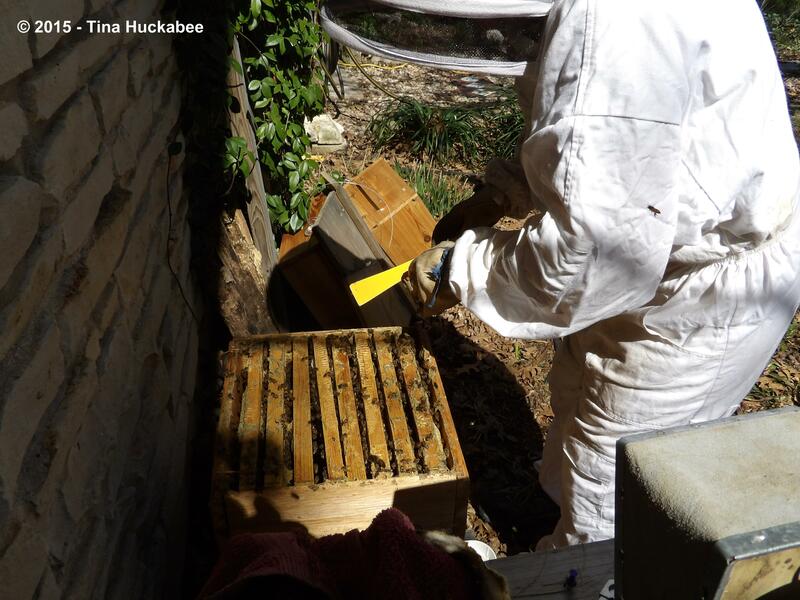 It’s tempting to put a hive out in the woods out back, though. 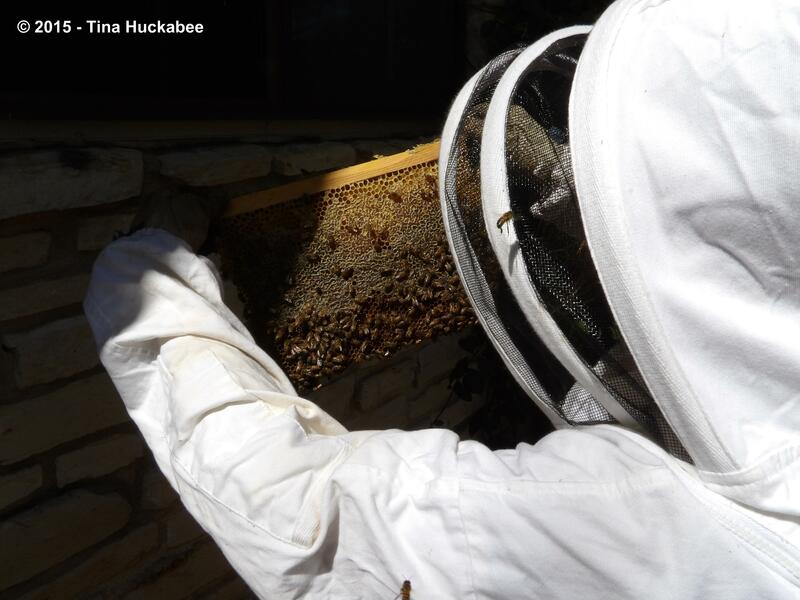 I thought I didn’t care for honey either, Lori–until I had my own little bees making it! I also originally wanted hives just because bees are cool and they need our help. It’s been a great experience with these gals. Looking forward to more of the same. 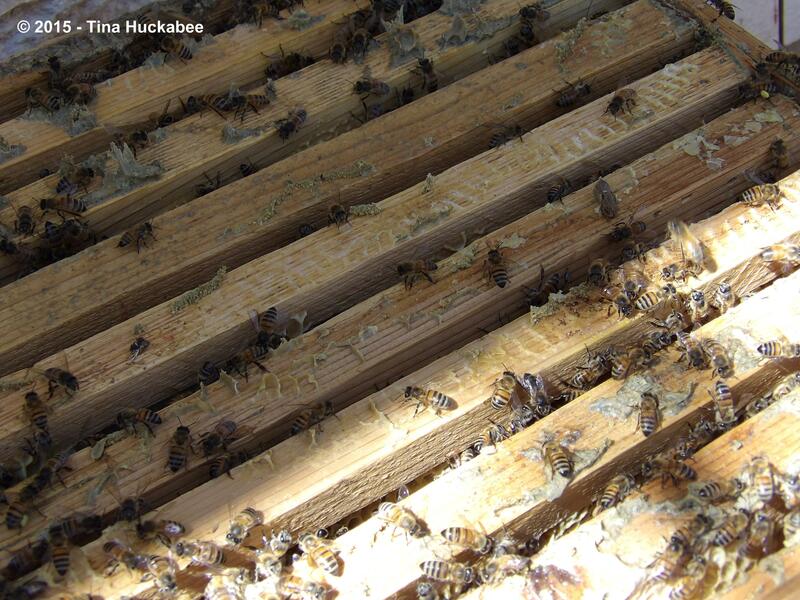 The hives don’t take up much room, but I’d recommend a shady spot, it’s easier for them to keep cool in the summer. What an incredible adventure with the bees and I love the scar Bee daddy added. 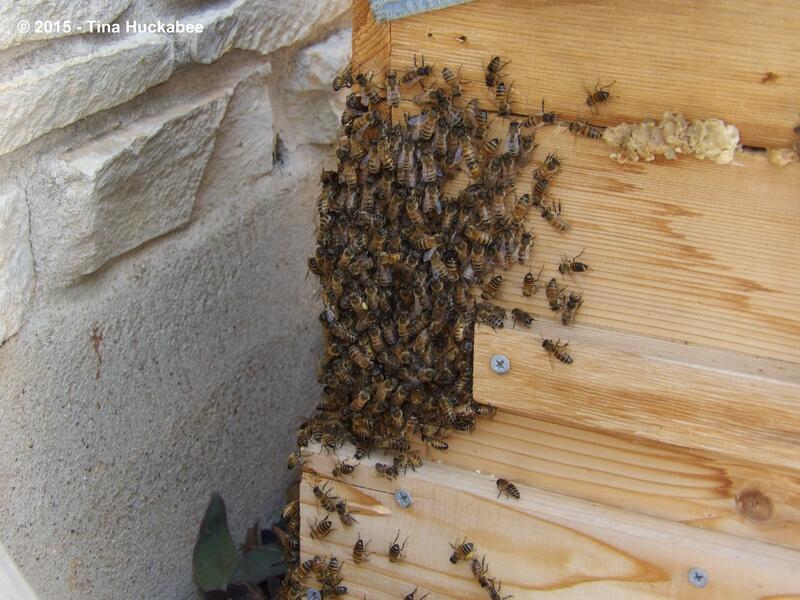 Lots of healthy bee activity is a great sign of more goodies to come. The beekeeping has been a fun adventure and sweetness abounds! !